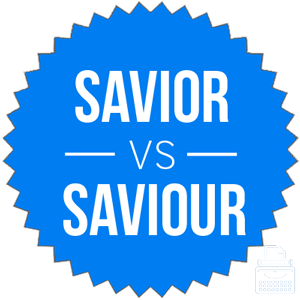 Home » Saviour or Savior – What’s the Difference? If you believe in the Christian tradition, the great thing about Jesus Christ is that he forgives all of your sins. Most people don’t count spelling mistakes as sins, but for those who do, the choice between savior and saviour presents a particular quandary. Which way should you spell the word? Many Christians call the word of the Lord “the Good News.” The other good news is that both savior and saviour are correct ways to spell this word, depending on where in the world you live. What is the Difference Between Savior and Saviour? In this post, I will compare savior vs. saviour. I will use each of these words in at least one example sentence, so you can see how they appear in context. Plus, I will show you a helpful memory tool that makes choosing savior or saviour a bit easier. What does savior mean? Savior is a noun. It refers either to a person who rescues someone or, as a proper noun, a title Christians use to refer to Jesus Christ. In the second sense, it is properly capitalized as Savior. Don’t capitalize it as a common noun, though. “She was my savior,” said the woman of the lifeguard who pulled her from the water. “And in the name of Jesus Christ, our Lord and Savior, amen,” said the reverend at the end of a lengthy prayer. Savior is the American spelling of this word. The French borrowed it from Latin and subsequently loaned it to Middle English. When savior emerged from Middle English in the 14th century, it was already an important part of the Christian tradition. Today, most Americans will recognize this word, even if they don’t consider themselves religious. What does saviour mean? Saviour is the British spelling of the same word. It can be used in all the same contexts, as both a common and a proper noun. As you can see from the charts below, which graphs these words in American English and British English respectively, Americans prefer the spelling savior and British writers prefer saviour. Saviour is closer to the Middle English saveour, which is probably why the British still prefer it. They can be sticklers for that sort of thing. Americans dropped the U from many words that end in -our to make them closer to their phonetic pronunciations. Neither version is any more or less correct than the other, it just depends on who your audience is. As noted above, both of these words are correct. Savior is the American spelling. Saviour is the British spelling. So, what’s an easy way to remember saviour vs. savior? Since saviour has a U, like United Kingdom, it should be fairly simple to remember that saviour is the British spelling of this word. Is it saviour or savior? Savior and saviour are two ways to spell a noun that means a person who rescues someone or the Christian God. It can be both a common and proper noun, depending on context. British English spells the word saviour. 1 What is the Difference Between Savior and Saviour?